Wedding Fair at The Lawn, Rochford Sunday 11th September. The sun was shining down on the wonderful grounds of The Lawn, Rochford on Sunday for their annual late summer wedding fair and Sticky Fingers Cake Co were there and what a busy day it was! We met lots of fab suppliers, some new guys and also some of our favourite wedding day businesses and of course, lots and lots of excited Brides and Grooms to be, some newly engaged and some coming to the end of their planning. It’s such a buzz seeing the excitement on their faces! 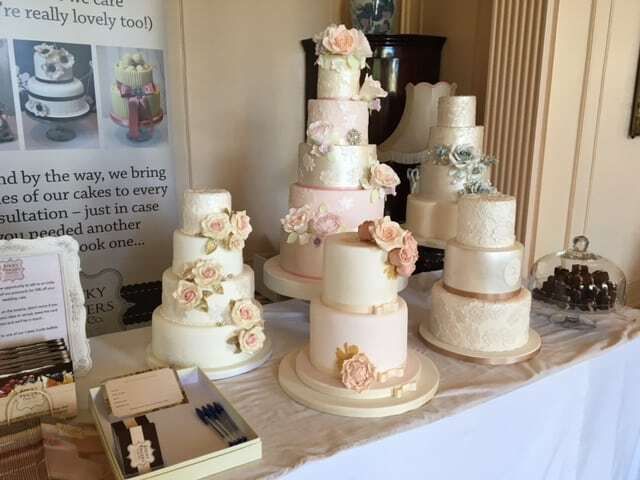 Our stand looked gorgeous with 2 new wedding cake designs on display plus our most popular designs, our new “Very Useful Cakey Guide” leaflets for couples to take away and of course samples of scrummy cake. We were also promoting our 10% off your wedding cake if you filled in our snazzy new postcards with your details. If you did fill one in, I’ll be in touch soon..
Our next wedding fair is at The Rayleigh Club, Rayleigh on Sunday 25th September. The last thing to say is 2017 is filling up quickly now, so if you did want a Sticky Fingers Cake Co wedding cake PLEASE don’t delay, I only take one wedding cake per day and dates are saved on a first come first served basis. It just takes a couple of minutes to email me to book a FREE wedding cake consultation so let’s speak soon!